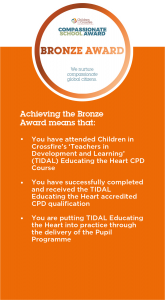 Celebrate your school’s Educating the Heart work with Children in Crossfire’s Compassionate School Award. The Compassionate School Award provides a supportive and motivational framework to guide you through the Educating the Heart implementation. 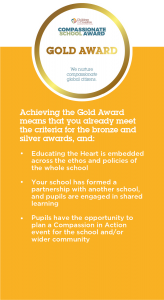 The Compassionate School Award helps your school gain recognition for its progress. The award has three levels. The level you can apply for will depend on the stage your school is at on its Educating the Heart journey. See which award level is best for your school! Click on the relevant award above to submit your application for your school award!